Well, there is always a first and after almost four years of posting pictures and writing about how good a ton of concerts have been, I finally went to one which yielded no pics and very little to write about. I was anxious to see Art Garfunkel as I recently saw Paul Simon and felt that I must round out this incredible duo if not together then as separate solo artists. I have to say that the show had a lot to contend with as I have not been in the mellow , laid-back relax mood that I am typically in, and my patience for crowds was quite limited. This wasn’t a crowd that I have been accustom to either….no energy and very stuffy. 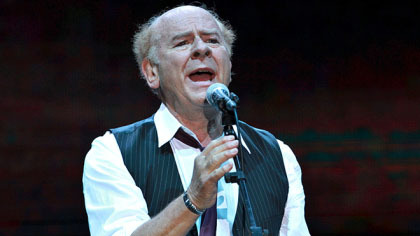 Mr. Garfunkel was also not performing quite to the energy level that I needed that night. I did enjoy when he performed The Boxer, Scarborough Fair and Homeward Bound, but had to leave at the intermission. His voice was great and he sang the songs beautifully, but the mellow mood, soft music and the old man sitting next to me constantly farting forced me to make it an early night. I do regret not getting any photos, but as there was a fairly stern message before the show to shut off all electronics, and Mr. Garfunkel reciting one of his poems about hating distractions from electronics made me decide it was not worth it.. I was also a little concerned about getting a stern look or finger wag from one of my elderly neighbors or worse, a harsh “no photographs!” from one of the attendants forcing me to keep my camera well hidden. Oh well, there’s always a first…hopefully it will be the last.